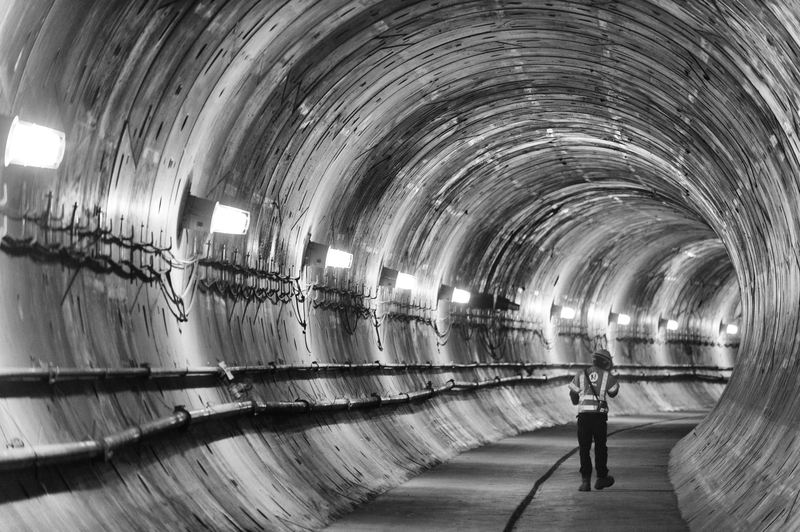 A Metro employee in one of the underground tunnels under Crenshaw Boulevard for the Crenshaw/LAX Line. Photo by Steve Hymon/Metro. Check it out: an end of the year list that actually arrives at the very end of the year! Instead of listing every single thing that happened at Metro this year, I decided to focus on 10 developments that I think will prove to be the most important to our everyday rider or area resident. Disagree with any of the following or want to add info or context? Comment please. That’s the fun thing about lists. 10) A number of changes were proposed for the Orange Line in 2017. A Measure M project might add crossing gates and a one-mile bridge over five intersections. The San Fernando Valley Service Council next month will consider a proposal to run a shuttle between Warner Center and Canoga Station and make other bus improvements in the area. Work is already underway on efforts to electrify the line — a goal embraced by Metro in 2016. Bus rapid transit is often promoted as a smart alternative to pricier rail projects. While the Orange Line has about 25,000 average daily boardings, it doesn’t quite carry rail-like numbers. So it’s interesting to see the agency seek to improve what it already has and make BRT as good as it can be. 9) The Metro Board voted 12 to 0 to fund local road improvements — and NOT build a freeway tunnel — to help improve traffic flow around the 710 freeway gap between Alhambra and Pasadena. Many Board Members said they hoped to do something immediate rather than wait years for a freeway tunnel that may have never had enough funding and/or political support to be built. Many local observers saw this is yet another sign our region’s freeway building days are over as there just wasn’t enough support from pols or residents for a tunnel. Personally, I think that’s certainly a fair point of view, but I also tend to think of this as a unique controversy that finally ran its course. Going forward, it will be intriguing to see if traffic on surface streets in the gap — especially on residential streets — can be better managed or reduced. 8) Good News/Bad News for Metro on the funding front. Courtesy of lawmakers in Sacramento and Gov. Jerry Brown, a bill known as SB1 raised the state gas tax and vehicle registration fees effective Nov. 1. And the collection of the Measure M sales tax — approved by L.A. County voters in 2016 — 1. Both SB1 and Measure M will provide our region with significant funding for local transpo improvements. The rub is that not much has happened on the federal funding front. We head into 2018 with more questions than answers about the federal New Starts program that helps pay for local transit projects. 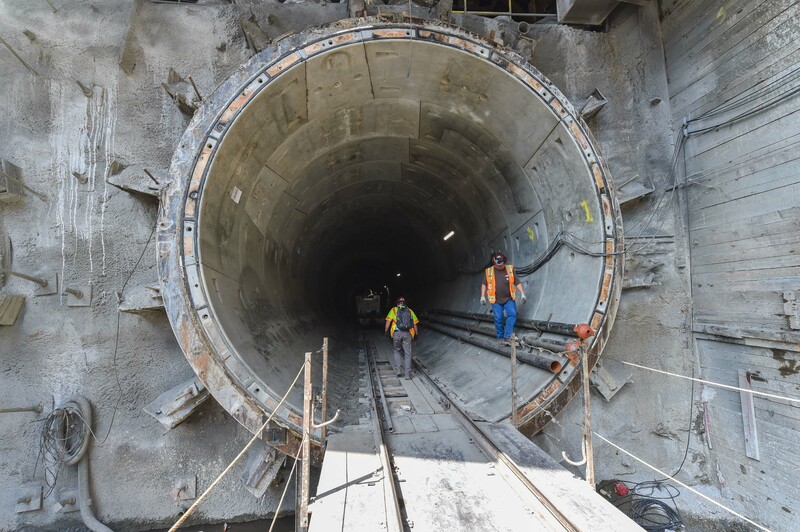 In our region, the next project that needs federal money is the third phase of the Purple Line Extension between Century City and Westwood. 7) I’m usually reluctant to make a big fuss about transit projects with no funding source. But it was nice to see an initial Metro staff report burp forth this year on some big-time improvements for the Blue Line. One big fix would be getting the section of track between the junction of the Expo Line and Pico Station off the street. The possibility of running express trains and other street separations are also mentioned as warranting further study. There is no Measure M project directly for the Blue Line and these are very expensive proposals. Still. Given that the Blue Line remains Metro’s oldest and busiest light rail line, it’s refreshing to see upgrades getting some study and Blue Line improvements are in the 28 by 2028 plan to be discussed by the Metro Board next month (see below). 6) With bus ridership in decline across the country (and at Metro), Metro’s Office of Extraordinary Innovation has shepherded a couple of ride-sharing type projects that should launch in the near term. The first is called Microtransit and would use bus shuttles to provide on-demand, flexible route service in a given service area. The other is a partnership-in-the-works with Via to provide inexpensive rides to three to-be-determined transit stations. These are pilot programs and there’s a lot to be tested and learned. Given the popularity of Uber and Lyft, it’s refreshing to see something new being tried. 5) Considerable progress was made on the three Metro Rail projects under construction. Inglewood: looking west from future La Brea Station. One of the Regional Connector tunnel entrances at Little Tokyo Station. 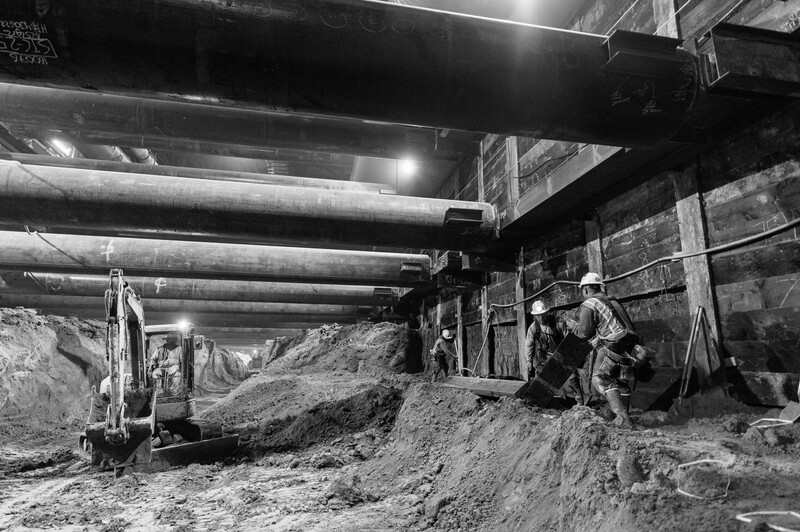 Work at the Purple Line Extension’s Wilshire/La Brea Station earlier this week. Click above for more pics. Photo by Steve Hymon/Metro. Construction progress. Track installation continued on the Crenshaw/LAX Line, excavation was nearing completion on the two Regional Connector tunnels under DTLA and station excavation continued for the Purple Line Extension’s first segment (Wilshire/Western to Wilshire/La Cienega). 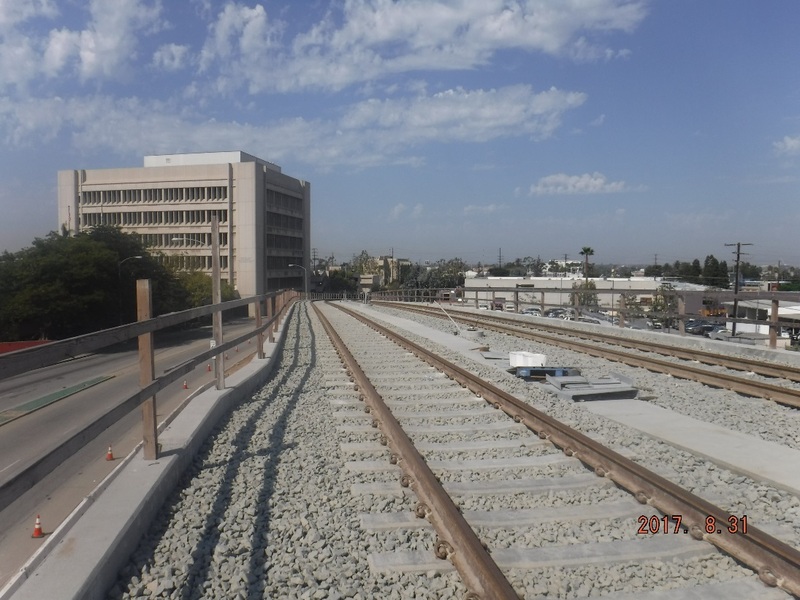 The Gold Line extension to Claremont and Montclair also held a ceremonial groundbreaking earlier this month, although major construction won’t begin until 2020. And the new platform for the Silver Line adjacent to Union Station’s Patsaouras Plaza is moving along. As planning advanced, we also got a better idea of some of the current alternatives for projects such as bus rapid transit or light rail between Van Nuys and the Sylmar/San Fernando Metrolink Station, the Airport Metro Connector station, the Eastside Gold Line Extension and bus rapid transit on Vermont Avenue and between North Hollywood and Pasadena. And, of course, Metro Bike Share expanded to Pasadena, the Port of Los Angeles and Venice. 4) The Women’s March. Metro officials estimated that there were 592,000 boardings on the Metro system on Jan. 22, a new record. There were certainly waits and crowding and service had to be added in the morning as it became evident crowds were huge. But the march proved that the Metro Rail system can carry a lot more people than the 360,000 boardings on the average weekday. Source post. 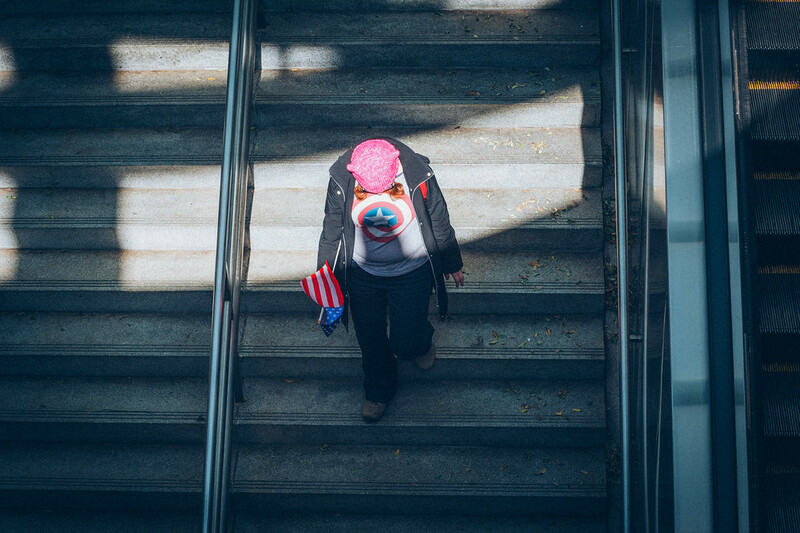 Quasi-related: the Metro system helped riders reach a variety of marches in DTLA over the course of the year. I took the pic below — my favorite from the past year — after an immigration march in February. 3) Metro hired the LAPD and Long Beach Police Department to join the Los Angeles Sheriff’s Department in patrolling the Metro system, which began last July 1. The idea is to greatly increase police presence on the system — a concern expressed often by current and former riders. Source post. How’s it working thus far? At this point only crime numbers through August have been released, which is too early to really determine long-term trends. Anecdotally, I’ve definitely seen an uptick in Metro security officers as well as police on my Gold Line commute and in the DTLA area, where I ride the most. What are you seeing, riders? Quasi-related: Metro also tackled another long-standing issue with a new etiquette campaign featuring Superkind and Rude Dude. 2) The Metro Board in May voted to restructure and reimagine the agency’s bus system. The Metro Board decided its time to give the nation’s second-busiest bus system a retooling, so to speak. Photo: Metro. It’s hardly a secret that transit ridership has taken a pronounced dip at many large agencies across the U.S. over the past three years. At Metro, the rail numbers have been flat while the losses have been on the bus side with average weekday ridership at about 904,000 in 2017 compared to 1,141,686 in 2013. A concurrent study will look at bus service by other muni providers in the county. 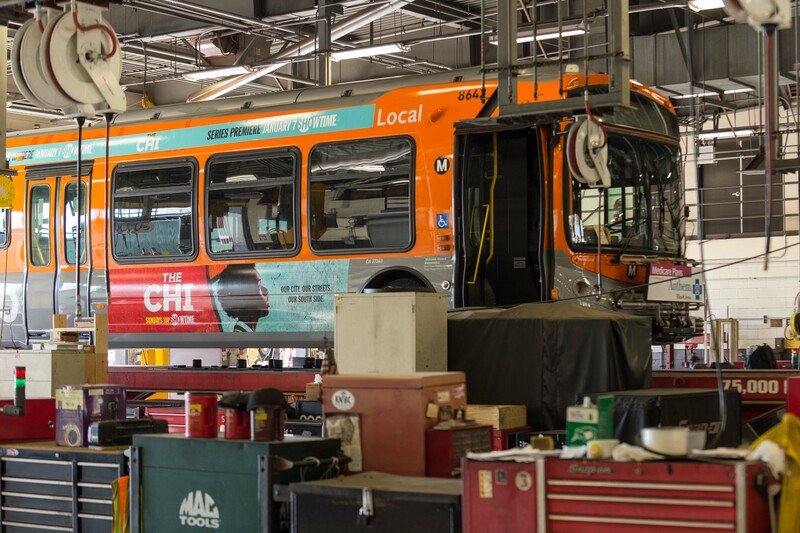 The Metro bus restructuring effort is planned to be a three-year process with changes not going into effect until late 2019 at the earliest. I think this is a positive development and long overdue given that many bus routes have been existence for decades without much consideration of the way riding patterns and communities have changed. 1) A deal for Los Angeles to host the 2028 Summer Olympics and Paralympics was announced this summer. Yes, 11 years is a long ways off. That said, the Olympics still earn a very large global audience and there’s no reason to think huge crowds won’t descend on the L.A. region when it’s our turn. The Olympics, I think, will provide a useful catalyst to work on some of our region’s long-standing issues — such as building a cohesive transit network and doing something to better manage car traffic. We already have a number of Measure R and M projects in the works that should be done by the summer of ’28. Los Angeles Mayor and Metro Board Chair Eric Garcetti has also proposed trying to accelerate others through the Twenty-Eight by 28 Plan — if the funding can be found. The plan is scheduled to go to the Metro Board in January, helping 2018 get off to an intriguing start. Thanks for reading and riding and Happy New Years to everyone! I also blather on about transportation and other things on Twitter. Love the extra security. Love to see half the train car squirm as the cops stroll through since most don’t pay especially on the Blue Line!